Epox-E-Glue 200gram Kit Coloured : Boatcraft Pacific, the home of wooden boat building. A two part epoxy glue, it comes as two nearly equal containers of paste. It is fully water proof. Equal parts of each are mixed together. This gives a thixotropic paste which will adhere tenasciously to nearly anything and which is also able to fill large gaps and maintain strength across them. The amount of part A and Part B to be mixed can be judged by eye to be nearly equal. The Hoop Pine colour has been matched to Hoop Pine and the Cedar colour has been matched to the typical Western red Cedar colour. The 200 gram kit has a 100 gram container of resin and a 100 gram container of hardener. 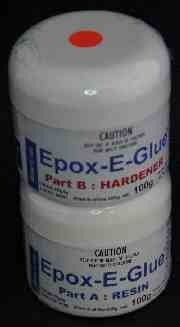 Epox-E-Glue will adhere to most things provided proper surface preparation has been done. Some plastics and some metals require special surface preparation.